Last night’s rain and storm activity is set to be repeated later today and tonight. 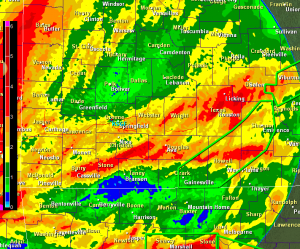 The rain yesterday, which dumped daily records for Springfield and West Plains (2.50″ and 2.01″), has left behind some flash flood warnings in areas of Howell, Douglas, Ozark, Shannon and Oregon Counties. 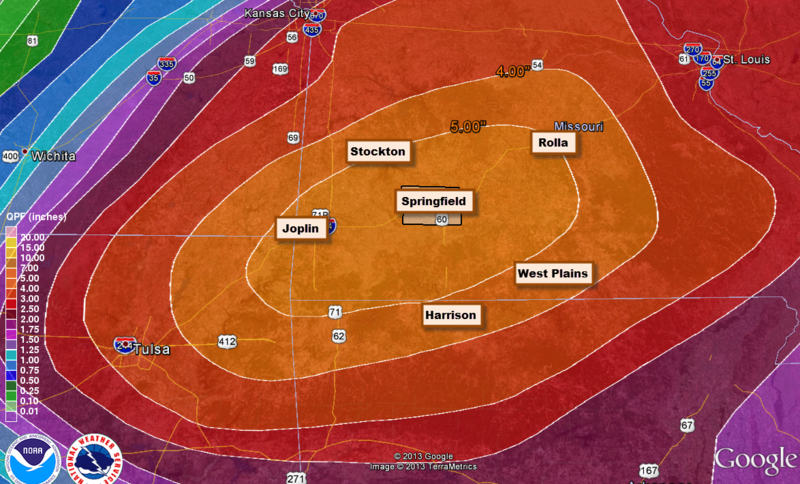 I included the radar estimation chart. The areas in red need to be on the lookout for any additional rain received tonight which would quickly lead to flash flooding. A cool front will be dropping through later night. This will set the stage for possible severe storms out ahead of the front and another large area of heavy rain to develop behind this system. There is a risk for tornado in the initial storms that develop and in any squall line which forms later in the evening hours. Large hail is also possible along with straight-line wind damage. The big rains will take shape during the late evening and overnight hours. 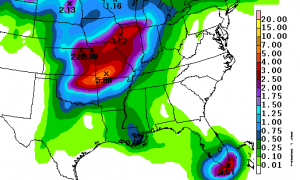 Widespread 2-3″ totals seem a safe bet. The cold front will continue to push through, gradually improving conditions on Saturday and providing us with a great Sunday. There are some new features on the “Pan and Zoom” radar. 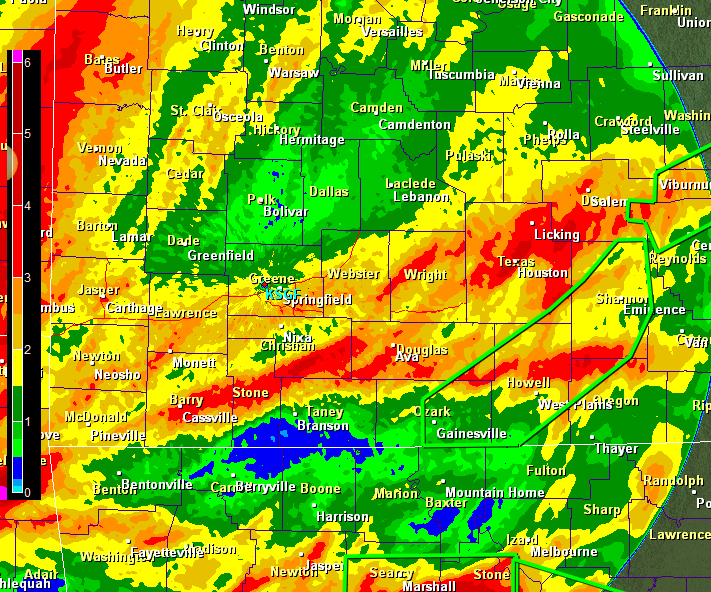 The latest is the ability to look at storm reports including flooding reports. Please check this out as the storms get going later today. Stalled cool outflow areas will play a role in storm development today along with an increase in instability. Storms which could fire this afternoon in southeastern Kansas and northeastern Nebraska immediately ahead of a batch of cool air left behind from overnight storms have a chance to become severe quickly. The air out ahead of this cool air batch is destabilizing thanks to breaks in the clouds and the movement of more unstable northward immediately ahead of this feature. Computer models show this area to have increasing unstable air through early afternoon. 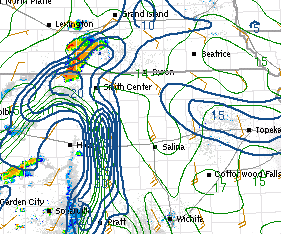 Additionally, low level rotation parameters are running pretty high from eastern Kansas into western Missouri. Computer models continue to maintain these values into the early afternoon hours as well. So I would watch any storms in northeast Oklahoma or southeast Kansas which could gain a foothold in this environment to become severe. Radar as of this writing at 11:40 a.m. is showing some possible development south of Parsons, Kansas and over northeastern Oklahoma. The area of concern is outlined on the Drawing Board. 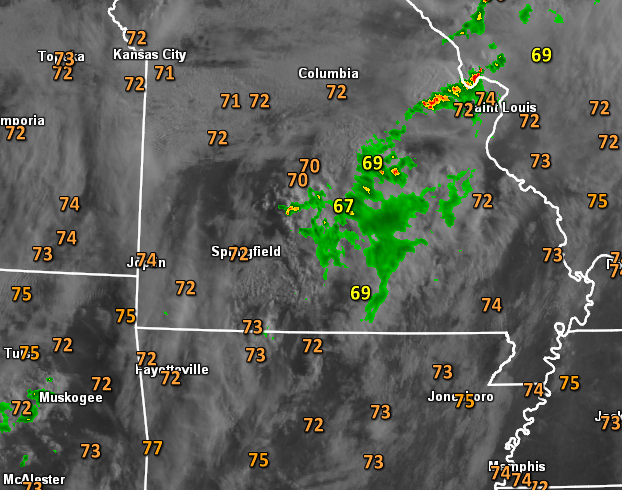 Also, a general area of increasingly unstable air is developing from Springfield eastward into the Ozarks. Isolated cell currently developing would probably continue to strengthen become a severe threat by later this afternoon. As I hit “publish”, a new discussion for a possible watch has been posted! The Ozarks will see rain and thunder today with some severe storms possible but the bigger day (and night) will be Friday. On the radar this morning, areas of rain and some thunder are over the Ozarks and coming up out of the southwest. This will keep us damp in some places and with the extensive cloud cover that comes with the rain, a little cooler. This cloud cover should also keep the air from becoming very unstable, in most areas. That’s the key, to watch the skies to see if sunshine, combined with decent humidity and a strong jet stream, will be able to provide small areas where severe storms might be favored this afternoon. I’ll monitor this throughout the day. It does look like more organized storms which develop out to our west and southwest will roll into the area later this evening and tonight with the potential for severe storms, probably the best of the day. The Storm Prediction Center has western Missouri in a 5% tornado risk for later this evening with a 2% risk extending as far east as Springfield (percent chance of a tornado within 25 miles of your town). This will likely be adjusted somewhat by 8 a.m. and I’ll “social media” the update. Friday looks like a repeat except I think the volume will be turned up with regard to severe weather and very heavy rain. Once again, the main threat would be during the evening hours. Severe storm erupting along a slowly moving cold front and out west near the dry line in Oklahoma will begin to approach the Ozarks by evening. The severe threat will transform to a heavy rain threat through the nighttime on Friday into Saturday morning. The inserted rain outlook from the Weather Prediction Center shows the potential for widespread 3-5″ rain totals between now and Saturday with much of that forecast to fall Friday night and Saturday morning. A flash flood watch is in effect for the Missouri portion of the Ozarks. The weekend will begin to improve on Saturday and the rain bands slip south and high pressure begins to clear the Ozarks out. We’ll get cooler and less humid air into the region. Sunday looks great with highs in the seventies. Monday morning cool as lows dip close to fifty. More showers and storm appear on tap by the middle of next week. We continue with warm weather, waiting on the approach of more widespread rain and possible severe storms on Thursday and Friday. This will likely be one of the warmest days of the week. We’ll have a tad more sun and a persistent southerly wind helping us into the lower and middle eighties this afternoon. More violent weather is expected today out to the west of our area but none of this is expected to be close to the Ozarks for today. There is a sign that some storms will arrive in the area later tonight. This is not expected to produce much in the way of severe storms. Thursday and Friday will be more active days in Ozarks for heavier storms as the entire jet stream pattern shifts more to the east. I think storms will begin to break out maybe as early as lunch time on Thursday and be more widespread than all of the previous days. 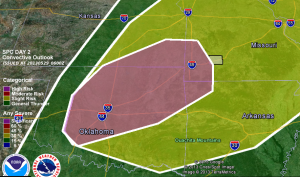 Severe weather is possible with this activity. The forecast for severe storms during the afternoon on Thursday will be highly dependent on small scale features such as cloud decks and cooler outflows from earlier activity. It’s a day where very localized but intense severe storms will be possible. By Thursday night, a round of storms from the west will probably roll in. 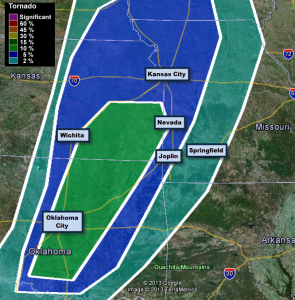 This would represent a more organized severe storm threat. It looks like a threat for damaging winds and hail exists for Friday too. My money would be on a line of storms developing ahead of the cold front for Friday evening and night. The above mentioned cold front will slow Friday night and Saturday providing us with extended heavy rain chances. We have the potential for widespread 3-5″ rain totals in the Ozarks with much of this falling Friday night and early Saturday. I have prior commitments on Wednesday, giving several talks on severe storms to CU workers. 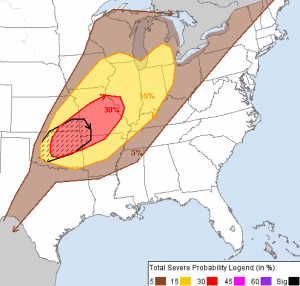 On Thursday and Friday, more severe storms are expected. 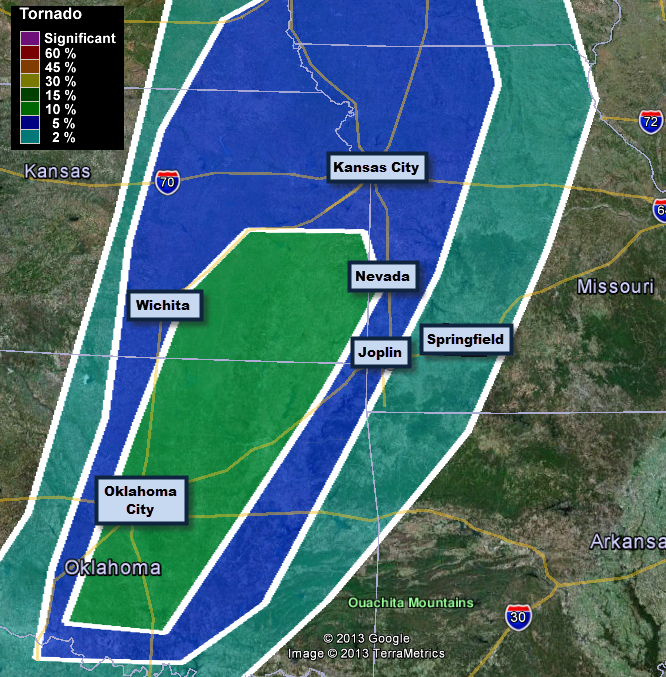 At this time, it looks as if the storm activity on both days will stay east of I-35 in Kansas and Oklahoma. This makes these two days either two separate “Quick Shot” chases (there and back in one day) or a modified “Lock and Load” (we chase, stay overnight and chase again the next day before arriving home). This has been an active spring with lots of noteworthy tornadoes and severe storms. This pattern is very good for “more of the same”! Storm chasing is a fantastic experience. It is thrilling to pick targets, make decisions, watch the storms ignite, track them, make adjustments, check the radar, recheck the data and rethink the chase! The tour will always push to the absolute limit of daylight to give you every opportunity to see storms. It’s even better if you don’t have to figure out where to go, fuel the car, buy the technology, the list goes on. Let a professional do the work! The cost for a “Quick Shot” is $199 with multiple person discounts. If anyone shows an interest in a “Lock and Load”, the cost is $499 (includes one night stay, single occupancy). Multiple person discounts and roommate savings would also apply. This Spring, I have logged over 4,800 miles in storm chasing! My total fuel costs are around $930. 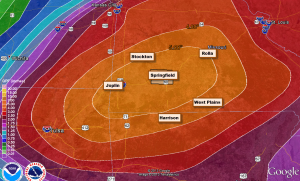 I’m serious about storm chasing and have a desire to make it a trip you won’t forget! The chasing tour went out to Kansas on Memorial Day. My choice for developing storms didn’t pan out as well as areas north of our position. 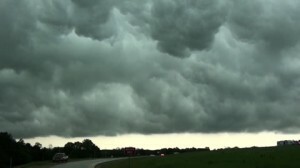 First off, we were treated to some awesome turbulent eddies on the underside of a cold outflow boundary in western Missouri along highway 7. We traveled up to Kansas City and then west along I-70. We ended up on the southern end of tornado watch which was hoisted for northern Kansas and southern Nebraska. The key meteorological players in this chase were the dry line, an old cool air boundary and an upper level storm coming out of Colorado. Chasing is full of decisions. One of them often is: do we need to travel farther or is where we are just fine? If this particular tour was un-tethered (meaning we could spend the night) the distance from Springfield is not much of an issue. But for tours requiring coming back the same day, distance plays a factor. Here’s what happened. 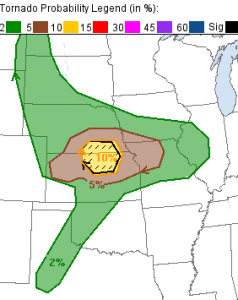 The combination of low level wind shear and unstable air was extreme across a large area of central Kansas, curling northwestward into Nebraska and even portions of Colorado. This was out ahead of a dry line. The dry line is a major player in the development of severe storms in the Great Plains. This line was moving eastward and was producing a great deal of converging, unstable air. (largest blue bulls-eye on map) We eventually ended up around Ellsworth, KS which is just southeast of Russell. (in the bulls-eye). All parameters looked good. Towers (tall cumulus clouds wanting to be storms) were visible from our location. As radar looked better we literally moseyed along, staying ahead of the developing cells. Now, rewind just a bit because a discussion did occur about the merits of travelling north to near the Nebraska border to chase. This would have been closer to the center of the eventual tornado watch. But everything looked nearly perfect where we were, so we stayed put. I say this because as it turns out, a supercell did travel out of Nebraska and into extreme northern Kansas. This tornado was captured near Cora, Kansas by the seemingly fearless (and armored!) Reed Timmer and troop. I included the video below. While we were staying ahead of the storms we decided to chase, a tight rotation could be seen on this northern storm. However, it looked severely wrapped in rain (video shows this) and therefore only someone willing to be right on top of it would see anything. That is something my tours will never do! After following the storms of choice it was starting to become clear they weren’t organizing. It appeared to be a combination of warm air aloft coupled with slightly less overall shear. This meant storms were being forced from below but needed continuous forcing to keep going. Also lack of great shear lead to multicell clusters rather than supercell storms. The low level rotation was however quite good which lead to shots like the ones I included in the video: hints of low level rotation but no supporting, sustained updrafts above. As a chaser, I’d love to see a tornado every time. But the goal of chasing with me is to learn about what makes severe storms, why they form where they do and why sometimes they don’t. 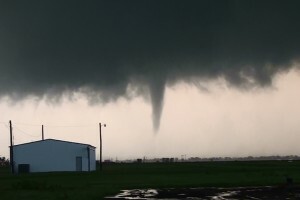 Seeing a tornado is a treat when storm chasing; it is certainly not a guarantee. Especially when additional non-meteorological considerations of safety and distance are thrown in. Today the Ozarks will be watching for storm development to the north and west which might slide into the Ozarks as we stay warm and humid. Outflows from previous areas of showers and storms will be monitored today in a a somewhat messy storm chance situation. There is a risk of some severe storms with some of these cells later today and tonight, mainly in areas far north and west of Springfield. Otherwise, the Ozarks will tend to clear up somewhat by later today, allowing our temperatures to rise into the eighties. The pattern over the rest of the week features a chance for storms backing off a bit on Wednesday and then inching closer to us Thursday and Friday. On Thursday and Friday, severe storms will again be possible but the details remain somewhat up in the air. During this time, heavier rain will likely begin to set up over somewhere over the Ozarks. A weekend cold front will put an end to the higher humidity and storm chances. Memorial Day will be very much the same as yesterday as the area continues to see southerly winds blow in warm temperatures and moderate humidity. Storm chances are present but fairly small. A line of thunderstorm over northwest Missouri this morning seems impressive, and in come circumstances this might advance toward the Ozarks, but it won’t reach us today. We saw a few much less intense cells around Lake of the Ozarks overnight. This same sort of ill-defined, low coverage storm development can be expected again later today. In short, the storm chances are low. We will experience southerly winds through Thursday in the area. Look for highs in the eighties across the board. Shower and storm chances will be small until around late Wednesday. Thursday and Friday will see an increased threat for storms as well. These will have to be watched for severe weather potential. A cool front finally arrives early in the weekend, taking our lows back down in the fifties with highs in the seventies. Our rain chances look pretty good in the time period of Thursday through Saturday as our wet Spring with well-timed rain chances continues! 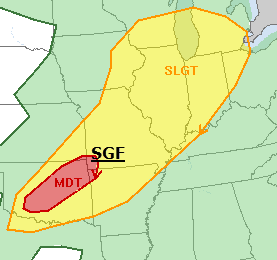 Note: 8 a.m. SPC now up to a moderate risk! The dry line, currently present in southwest Kansas will advance east and northeast today. It will do so into air which will be very unstable. 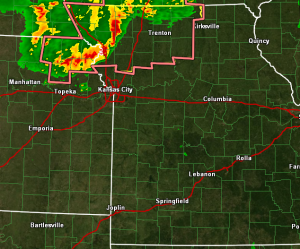 Also, a temperature boundary will be left behind by a line a storms now advancing through northeast Kansas. 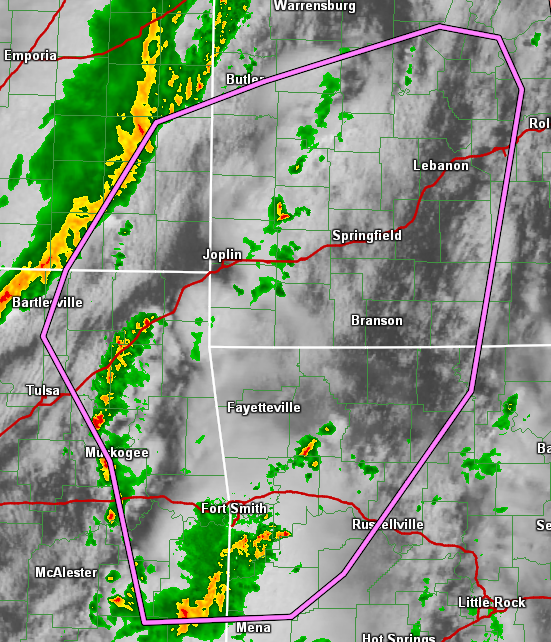 All of this will set the stage for possible tornado development. The area in yellow is pretty much the target area with only minor adjustments needed. I am hoping that any tornadoes that develop today will do so over open country! (my last two chases had tornadoes in metro areas: Wichita and Oklahoma City). This is a “Quick Shot” tour with no overnight stay. We’ll leave the city around 10 a.m. We would be back in Springfield between Midnight and 1 a.m.